Introducing Bombas, game changing athletic socks with a mission to help those in need. Bombasâ€™ Founders David Heath and Randy Goldberg decided to create the perfect pair of socks after learning that socks are the most requested clothing item at homeless shelters. They figured the better the socks, the more people would buy and the more they could donate to those in need. So they re-engineered the athletic sock from the toe up and and re-imagined what a sock company can do for the community: for every pair of socks you purchase, they donate a pair to someone in need. 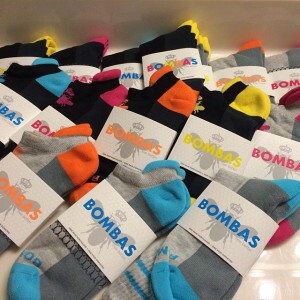 With a little help from crowd funding platform Indiegogo, Bombas raised $142,400 in forty days – the 3rd highest fundraising amount for a fashion brand in Indiegogo history – Â to create the only sock company to donate pairs to someone in need.Now fully launched as an e-commerce site, Bombas has donated 32,000+ pairs of socks to date to their charity partner, Hannah’s Socks, a non-profit whose sole mission is to get socks to those in need. Hannah’s has a goal to distribute 225,000 socks this year, and Bombas is here to help reach that goal this holiday season. Bombas takes their socks seriously–they’re technically advanced, incredibly soft, and they support your feet in all the right places while adding a splash of color in a mostly monochromatic sock world. Check them out at BombasSocks.com!